The Eight Immortals crossing the sea, from E. T. C. Werner's epic Myths and Legends of China (1922). Pictured in the image are (clockwise in the boat starting from the stern) He Xiangu, Han Xiang Zi, Lan Caihe, Li Tieguai, Lü Dongbin, Zhongli Quan, and Cao Guojiu. The figure outside the boat is Zhang Guo Lao. The Eight Immortals (八仙 in pinyin: Bā xiān;) are popular Chinese deities who play an important role in Chinese religion and folk culture. Most are thought to be actual historical individuals, born in Tang Dynasty or Song Dynasty, and elevated to immortal status through personal piety, trickery or luck. They are usually depicted as a group and rarely individually. They represent an anarchic element in the Chinese pantheon, bringing health, prosperity and good fortune to individuals regardless of age, gender or social status. Stories of their exploits are found in the most popular (and enduring) Chinese folktales. In general, all facets of Daoism (philosophical, alchemical and religious) are characterized by an interest in prolonging life - with the ultimate end being the attainment of immortality. Unlike many other religious traditions, Daoism was tied to the natural and physical world, so the attainment of eternal life was understood as being contingent upon maintaining the body. More specifically, since the Daoist cosmology predicates material existence upon the transformations of qi (vital energy), and since physical death was understood as the cessation of qi flow, they understood that proper (i.e., qi-enhancing) techniques could prolong life (sometimes indefinitely). Such beliefs were compatible with folk accounts of hermits residing in harmony with nature, living forever in peace and tranquility. These accounts gradually developed into a school of alchemical thought, who taught that immortality could be achieved through ingesting potions and elixirs (weidan (“Outer Alchemy”)) or through meditation and physical practices (neidan (“Inner Alchemy”)). When religious Daoism emerged in the early part of the first millennium, their celestial pantheon included many legendary figures that had allegedly attained immortality through the means discussed above. The Eight Immortals are such figures. Though tales of their individual exploits date back to the Tang (or even the Han) dynasty, they began to be recognized as a group later in the Song period. Daoism possesses a deep and abiding interest in the achievement of physical immortality. With the advent of religious Daoism, it is perhaps unsurprising that figures would arise who would represent this ideal in a populist form – one that would be amenable to veneration. What is intriguing, however, is the manner in which these undoubtedly ‘‘popular’’ figures manifest Daoist characteristics. First and foremost, the group known as the Eight Immortals is notable for its diversity. All the members, with their various ages, genders, class backgrounds, and occupations, represent a different subset of the human experience, which, in turn, stresses the attainability of the ideal of immortality. There are multiple paths to immortality, which are not in any way restricted to certain classes of people. As Kristofer Schipper suggests: "there are as many ways to become immortal as there are Immortals, and there is nothing systematic about it" . Further, the various adventures of the Eight (as told in myth and folklore), stress the Daoist ideal of wu-wei. They are most often depicted carelessly roaming from one place to another, or, as in introduction to the tale of the Jade Emperor’s Birthday, bobbing aimlessly in a boat “drinking, singing, and playing ‘guess fingers’” . In this way, they exemplify the “free and easy” lifestyle advocated by Zhuangzi as the path to the Dao. Likewise, many tales see the immortals (either separately or in concert) wandering through various people’s lives and, through a simple word (or a magic spell), making things better for them. There is an inherent morality to these tales, as the Immortals are often depicted travelling about in various disguises, rewarding those who behave in a selfless and ethical manner. Grouping together the archetypical clown, healer, alchemist, virgin, hermit and trickster characters, the Eight Immortals simultaneously reinforce social roles and transcend them, allowing people, especially the poor and the oppressed, to laugh, but also to find hope in their sometimes bleak living situations. For one example, when the Eight Immortals (ever the outsiders) are not invited to the Jade Emperor's birthday party, they decide to teach him a lesson by showing up unannounced, stealing his gifts (only to give them back again later), tricking him into thinking that earthly insects are a priceless treasure, and consuming huge quantities of food and drink from the royal table. As the tale ends, they reflect that "they only wanted to make a fool of the Jade Emperor and had succeeded in doing so" . Given the degree to which the Celestial Bureaucracy mirrored its earthly counterpart, how could a downtrodden peasant fail to be amused and heartened by such antics? Lü Dongbin - a "carefree dropout" who failed at the Imperial examinations and chose instead a life of "free and easy wandering" . He, along with Iron-Crutch Li, are thought to be potent healers. Li Tieguai (Iron-crutch Li) - a former renunciant whose penchant for astral travel led to the loss of his body, who was forced by these circumstances to take up residence in the recently-deceased body of a crippled beggar. He Xiangu (Immortal Woman He) - the only woman in the group, she was granted Immortality as a divine gift for her virginity and filial piety. However, other accounts describe her becoming immortal after receiving the seed of Lü Dongbin through sexual congress. Zhang Guolao (Elder Zhang Guo) - a former bureaucrat known for gleefully facing backwards while riding his donkey. He is the archtypical clown of the group. Lan Caihe - an androgynous street performer who is known for his/her generosity towards the poor. Han Xiang Zi (Philosopher Han Xiang) - a talented musician and poet who took great joy in the natural serenity of the mountains. He represents the idealized Daoist mountain-man (or hermit). Zhongli Quan - an elder immortal, believed to have been born in Han times, who is typically depicted as an aged, untidy, obese man. He is thought to have attained immortality through his alchemical prowess. As can be seen, the Eight Immortals represent archetypal characters while simultaneously defying easy characterizations. They did not all begin life as moral exemplars, but instead achieve their magnanimity and perspective as a side-effect of their immortality. Likewise, their commitment to Daoism is not (as a rule) a doctrinal one. Instead, it rests upon their internalizations of Dao and wu-wei, which allow them to easily and carelessly respond to the challenges of the world. Though the Eight Immortals are rarely worshipped, they still play an important role in Chinese religio-spiritual life. Specifically, they are seen to possess de (supernatural efficacy), which allows them to intercede in human affairs, often through shamanic or spiritual practices like "séances and inspirations"  For example, Chinese youths sometimes play a mediumistic "game" called the "'Descent of the Eight Immortals' (jiang baxian), "which involves a boy entering a trance, confirming that he is (channeling) Lü Dongbin, and writing cryptic messages in a tray of sand . Also, Some of the immortals are seen to have a particular area of expertise, leading individuals to offer them sacrifices in exchange for intercession in those realms. More specifically, Lü Dongbin and Li Tieguai are thought to possess healing powers, Zhang Guolao is seen as a bringer of (male) offspring, and Zhongli Quan is associated with longevity. Finally, the Eight Immortals are included in some of the Divine Registers used in religious Daoism, meaning that Daoist priests may invoke them to provide blessings, exorcisms or other magical aid, when petitioned by lay devotees. The Eight Immortals are also a near-universal presence in Chinese temple culture. Most Daoist temples have "the eight symbols of the Immortals arrayed in front of the main temple or in front of the main altar. Usually mounted on spear-like poles, they have the task of warding off evil influences" . Some of these temples also include shrines to specific immortals (most often Lü Dongbin or Zhang Guolao). In more rare cases, entire temples are dedicated to the Immortals, including the Eight Immortals Palace (in Xian) (八仙宮) and the South Palace (南宮), popularly nicknamed Eight Immortal Temple (八仙廟) (in Mu Zha (木柵), Taiwan). Intriguingly, statues and images of the Eight Immortals are also common in Buddhist temples, where they are used as decorations and are also placed at the shrines to the "lesser deities" - a fact that attests to the universality of public reverence for them. The Eight Immortals are one of the most ubiquitous elements of Chinese popular culture. They are understood to bring joy and prosperity, so their images are common at various interstitial moments (including weddings, the birth of children, and New Year's festivities). Their likenesses (or their symbols). can be found on banners, baby bonnets, temple roofs, greeting cards, and even on women's dresses. Their images play a role in public entertainment, as all traditional theatre and opera performances begin with a "short but obligatory ritual playlet" depicting Immortals dancing, drinking, laughing and practicing kung-fu . Additionally, they are used as part of Chinese geomancy (feng shui), as each immortal has come to be affiliated with a particular hexagram of the Yi Jing (I Ching) (and, as such, becomes available to defend against negative energies coming from that quarter). However, the Eight Immortals are best known through folk tales, told by grandparents and professional story-tellers alike . These tales have such cultural currency that they have been dramatized, presented in comic books, and even made into popular films. 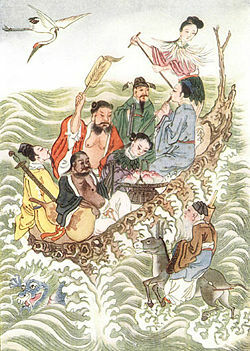 The Eight Immortals Cross the Sea (《八仙過海》 bā xiān guò haǐ), a non-attributed work from the Ming Dynasty. In it, the Eight cooperate, using their powers to cross a choppy ocean. This episode is immortalized in the idiomatic Chinese phrase "Eight Immortals cross the sea, each revealing their divine power" (八仙過海，各顯神通), which describes a situation where everyone uses their particular abilities to achieve a common goal. The Eight Immortals Depart and Travel to the East (《八仙出處東游記》) by Wu Yuantai (吳元泰), which is arguably the most significant of these writings. Indeed, this Ming Dynasty document provides the source material for many of the films, paintings, comic books and theatrical plays about the Eight Immortals. ↑ Burton Watson, trans. Chuang Tzu: Basic Writings. (New York: Columbia University Press, 1996), 27. This page was last modified on 3 April 2008, at 18:03.